Deborah Gray at the 2012 Gourmand Awards in Paris, where her book, How to Import Wine – An Insider’s Guide, won Best Professional Wine Book U.S.A. and took second place in the international category. Deborah Gray didn’t even drink until she was 25 and tasted the Gewurztraminer that her father produced during his reinvention as a vintner in Australia. After that, she was hooked. 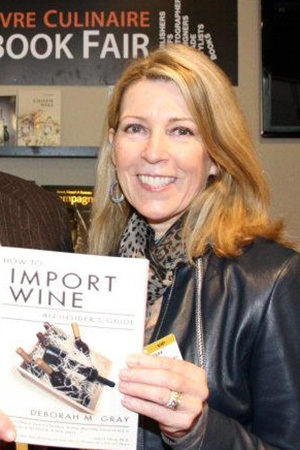 Gray began exporting his brand to the U.S., which led to more clients and the eventual writing of her book, How to Import Wine – An Insider’s Guide, which won Best Professional Wine Book U.S.A. in 2011 by Gourmand International. It also came in second in the International Professional Wine Book category. 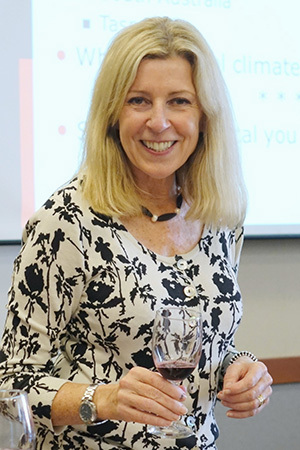 As an instructor with San Diego State University’s Business of Wine Professional Certificate program, Gray shares her vast knowledge in her Importing and Distribution course, and also teaches the Australian Wines Intensive, for which she is uniquely qualified, as a native Australian. Gray answered a few questions about her career and her SDSU courses. I’ve been a licensed wine importer for 26 years and California distributor for 18 years. My education and career were in an entirely different profession until a career turn into the wine industry came unexpectedly when my father wanted to export his wine brand to the U.S. and asked me if I would help. In 1973, my father began his first vineyard in a town called Cowra (Australia), now a recognized appellation. The brand was sold years ago but the vineyard is still owned by my family. That led to taking on more small, family-owned wine brands from Australia and branching to New Zealand. This was a successful strategy until the Great Recession when higher-end Australian wines also fell out of favor. This difficult situation gave me time to write my first book, How to Import Wine – An Insider’s Guide. I continued to import wines until 2010 but it remained a challenge so I began consulting to the wine industry – mostly new importers but also foreign wineries and others wanting to know how the U.S. system worked. Many of them found me through the publication of my book, which was the first of its kind. 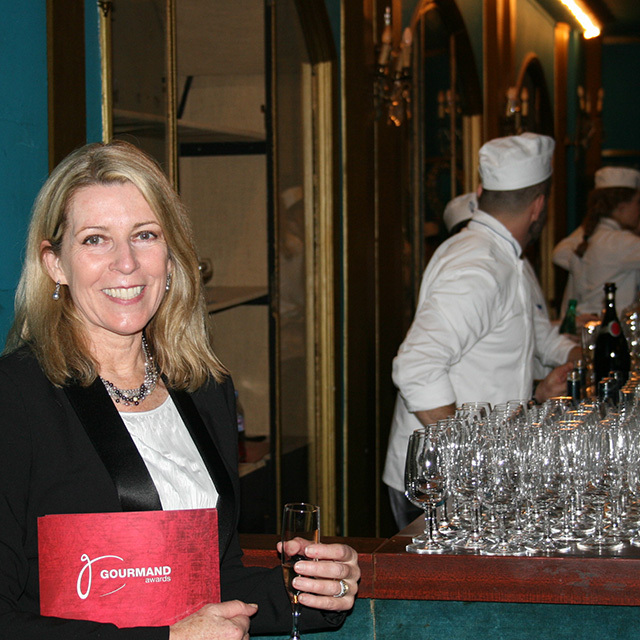 How did you come to be an instructor with SDSU’s Business of Wine program? I was drawn to teaching as a result of writing my book and consulting, simply from a desire to communicate the knowledge I had accumulated through all the years of my career. I contacted the director of the SDSU Extended Studies program at the time and she was very interested so we met to discuss ideas. Unfortunately, she left SDSU shortly after, but referred me to the next director, Giana Rodriguez, who fortunately was just as interested in expanding the program and we explored subjects that I could propose. From those she chose Australian Wines and Importing and Distribution. I devised the curriculum for each course and began with Australian Wines five years ago, in April 2013, and later Importing and Distribution was added. Flexibility within courses and material as conditions and student needs require; and diversity of course subjects and material are huge strengths. Utilizing a range of qualified and experienced instructors gives students a thorough education in each area and a comprehensive certificate program to benefit their future careers. Support from professional SDSU program staff is invaluable for both instructors and students and keeps the program dynamic and meeting student needs. As an instructor, I couldn’t ask for a better environment. I feel very fortunate to have found this position! Deborah Gray teaching her Australian Wines Intensive course at SDSU. What are some key takeaways from your Importing and Distribution course? Real life experiences and knowledge from someone who has spent so many years in the field and is willing to disclose it all. I continue to stay current with trends, emerging regions, U.S. consumer tastes and sales throughout the country through consulting and the research I often do to provide clients with the information they need to become successful. My clients represent so many different countries that it is really a window into contemporary conditions in the importing and distribution world. I take students from sourcing wine — what, where and how — to the logistics of getting it here as economically as possible, through compliance and regulation and finding distribution channels. It is as comprehensive as five weeks allow and gives them a very good idea of what this profession entails. In addition to material that prepares them for a career, some of which is technical and relates to the regulatory side, I introduce more interesting and appealing aspects of wine importing and distribution and tell the stories of my own mistakes and experiences. Through PowerPoint slides, notes, and handouts, I feel they also have many of the tools they could never acquire on their own to take with them. We also taste wines at each class to discuss the relevant aspects of style, region, packaging and price, all of which they will have to determine on their own in this career. Do you have a favorite anecdote you share with students that illustrates an important point about importing, distribution, or the required relationship building? I tell many stories to demonstrate different points, from my own mistakes and why it’s important to do it differently, and from my successes to show them how it was possible. I am often asked by clients whether it’s possible to enter the industry on a limited budget. I give the students examples to approach their new venture with confidence, regardless of budget. Other stories are from my interactions with winemaker and vineyard owners, some of which are amusing and others are important to provide students with examples of ways they can connect customers to the wine itself. It’s more important than ever to consumers to feel a connection to the brand through the stories, histories, and people behind the wines. Homework is assigned for each class as exercises in things like sourcing wines, developing a portfolio, presenting a proposal to a distributor or conducting tastings and wine dinners, all of which they’ll have to do if they decide to become an importer or distributor. I invite the students to share their work in class so that we can discuss it and also so I can give them suggestions and recommendations. What are some key takeaways from your Australian Wines course? Australian wines are not just something I’m familiar with, but Australia is the country where I was born and raised. As an importer of Australian wines for many years, I have personally visited most of the wine regions and developed relationships with winemakers and producers so I feel uniquely qualified to teach the subject. I provide students with in-depth instruction on regional diversity and particular characteristics of appellations and individual vineyards. I also give them a history of Australian wine, its emergence on the world stage and what contributed to its dramatic decline in the U.S. This is now a particularly exciting time for Australian wines in the U.S. High quality wines are coming back to the market and receiving a lot of positive attention from distributors, retailers and publications. As a result of my continued relationships within the Australian wine industry, I have access to wines at wholesale prices that may not yet be available to the San Diego market, giving the student the first opportunity not only to taste new wines but taste wines at a higher price point than might normally be available because of the significant discount. I choose wines that complement specific regions studied. Background information about the actual vineyard and wines connects the course material to the tasting in a very real way. Tell us more about how your love of wine began. It was not until long after my father started a vineyard. When I tasted the Gewurztraminer he produced, I was hooked! From that, I developed a love for the rich, buttery Chardonnays that the Cowra vineyard was producing at that time and were also gaining attention in Australia. As with most wine appreciation evolution, I progressed from white wines to red, from lighter to more complex wines. However, it wasn’t until I started importing that I had the opportunity and desire to really pursue tasting many different wines and styles and discover the wines I liked best. It did make me wish I’d started sooner! Communicating my passion for wines and this industry to the students is a strong motivator for me. And of course the desire to articulate knowledge of my subject to prepare them for what may be their chosen profession. I love being so comfortable with my subject that I’m confident that the information I give them is fact-based and sound. I love being able to contribute to their education. Teaching at night can be challenging, when people may have worked or studied all day and have to work harder to stay alert. Since I am so aware of that, I try to keep their interest through my stories, and encouraging class participation and sharing of their own relevant experiences and stories. When I see engagement on their faces, I hope it means I’ve succeeded. I think this is like asking who your favorite children are! Or maybe your favorite food. Wine choice can vary depending on the situation, the mood or the food pairing. As a wine style, my favorites are Burgundy, Rhone blends and old vine Grenache. Some of my most memorable wine experiences were a vertical tasting of several years of Penfolds Grange, Australia’s pinnacle icon. And Kosta Browne’s Pinot Noir from Russian River. Discovering Italy’s Barolo was an eye-opening treat and Italy produces some of my favorite red wines. Initially a graphic artist, because that’s where my talent seemed to lay. Later, a writer. Probably many things! But I’ll pick just two: One, that I didn’t drink at all until I was 25 but I was a bartender in Spain when I was 18. Clearly, a very bad bartender. Two, I was a motorcycle courier in Sydney when I was young. After five years teaching and even with a full-time consulting business, I enjoy teaching these courses as much as ever. Students’ backgrounds, ages, and career aspirations vary but they choose to take my classes and I continue to want them to get the most out of them.